See how Dr. Energy Saver insulates your crawl space to improve your home energy performance. Most homeowners tend to avoid the crawl space, and they are often unaware of the problems that may be occurring in there. Crawl spaces are a major problem area in a home's building envelope, as air leakage often leads to energy loss, uncomfortably cold floors, and other problems. Dr. Energy Saver specializes in insulating crawl spaces to create a clean, efficient space that will make your home more comfortable. If you have issues with cold floors above the crawl space or rising energy costs, contact us today to get a consultation and estimate! Fiberglass batts installed between joists in a crawl space absorb moisture, lose R-value, and often fall out of place, as shown above. 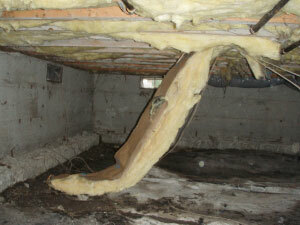 Unfortunately, far too many crawl spaces have the wrong type of insulation, if they have an insulation at all. In either case, this error causes a house to be uncomfortably cold or hot at different times of the year, and more expensive to heat and cool. A poorly insulated crawl space is also likely to be excessively damp, encouraging the growth of mold and wood rot. In a crawl space, fiberglass insulation tends to absorb moisture, which causes it to lose R-value and fall out of place, rendering it totally ineffective. Damp fiberglass is also a breeding ground for mold and pests which can cause wood rot and threaten the stability for your crawl space. If you have high heating and cooling bills, cold floors above the crawl space, or uncomfortable rooms in the house, Dr. Energy Saver can help. Here are our solutions for crawl space efficiency. Installed against foundation walls, rigid foam insulation won't lose R-value, fall out of place or be damaged by moisture. To get the results you want, you need a type of insulation that can perform well in crawl space conditions. Unlike fiberglass insulation, rigid foam insulation won't absorb moisture, lose R-value or encourage mold growth. It won't compress or fall out of place either, giving you lasting protection. 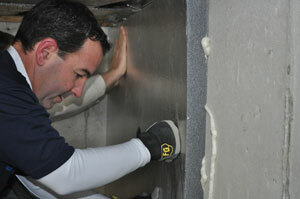 In crawl spaces (and basements, too), rigid foam insulation is usually installed against the foundation wall. By changing the location of the insulation, the crawl space can be brought inside the building envelope, which improves overall home energy performance. This ensures that rooms above the crawl space are more comfortable and you aren't wasting energy. 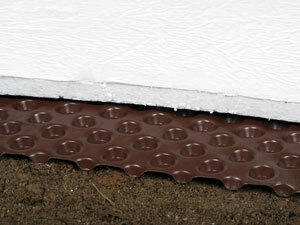 Floor insulation with drainage matting helps seal your entire crawl space into your building envelope. Insulating crawl space walls will always take precedence over insulating the floor, but floor insulation can be a valuable improvement for several reasons. If you experience significant heat loss, TerraBlock™ is a crucial addition because it eliminates a major source of energy loss. If you have a dirt floor crawl space, our TerraBlock™ insulation can be installed with a drainage liner to ensure you don't have moisture issues. TerraBlock™ is also ideal for uneven floors, as it provides a durable finished surface that can be used for storage. You don't have to put up with cold floors, uncomfortable rooms, and high utility costs caused by poor crawl space insulation. Your local Dr. Energy Saver dealer will carefully evaluate your home and recommend the best solutions for your needs. We install quality insulation that is proven to make homes more comfortable and efficient. Call today for an estimate!